This past week was taper week so I made sure to keep it easy and not try anything new this close to my race! Monday: Rest, 1.5 mile snowshoe with Lyla and another 1.5 mile walk with her. 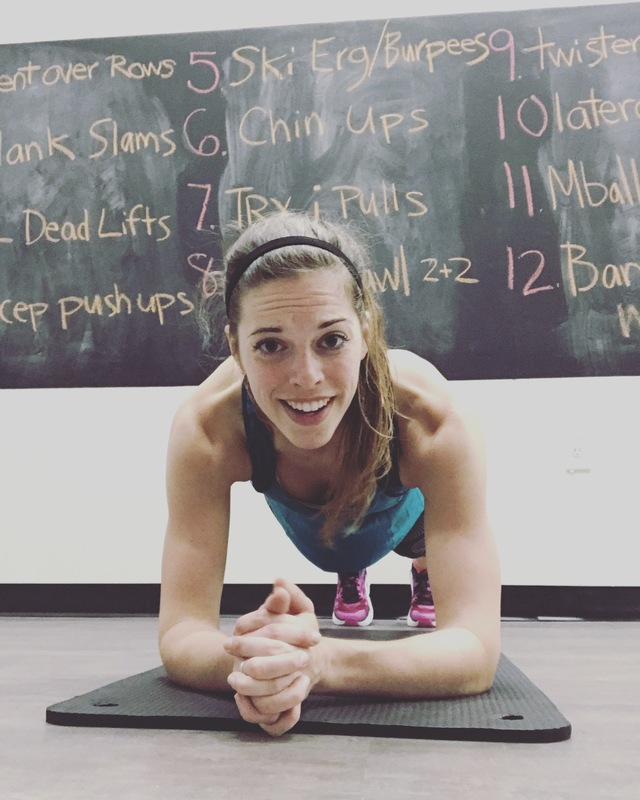 HEAT class and 6 min plank! 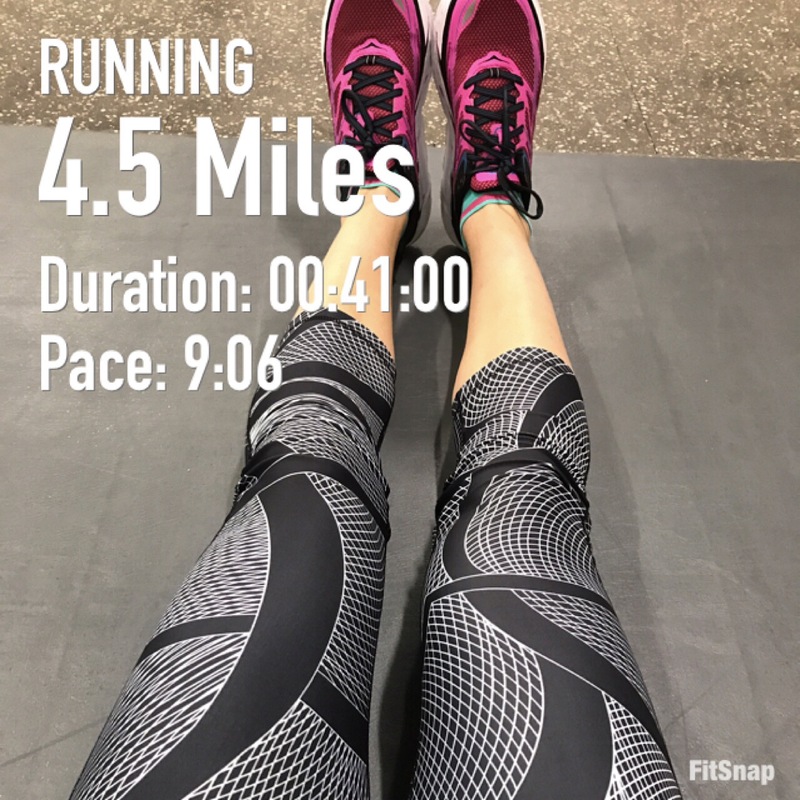 Wednesday: 4.4 easy miles and strength. 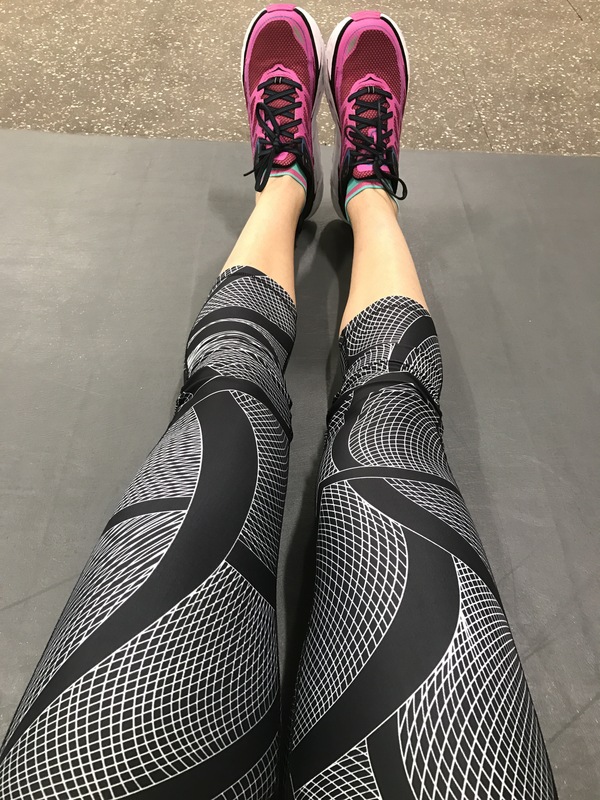 My strength included 7 min alternating planks, 5 min hip exercises, 30 minutes yoga and 20 min band exercises. 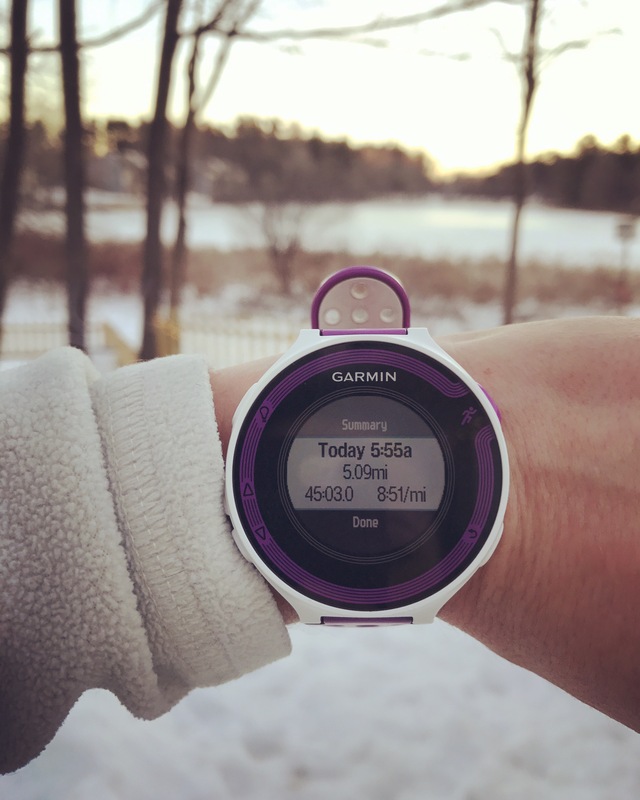 Thursday: 8 mile tempo, it was 65 degrees! Workout was 1 mile up, 6 miles at 7:20, 1 mile cool down. Actual paces for the tempo were 7:11, 7:19, 7:06, 7:17, 7:11, 7:26! Now in the homestretch to my marathon, can’t wait! Trying to get my packing list done today so I have enough time through the week to get packed and mentally prepared!! 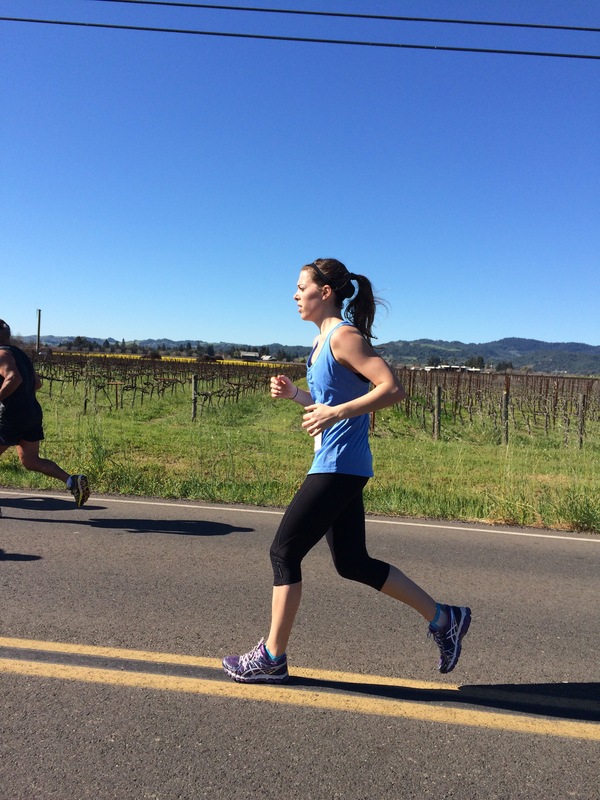 Today was my last long run before the Napa Valley Marathon next weekend. 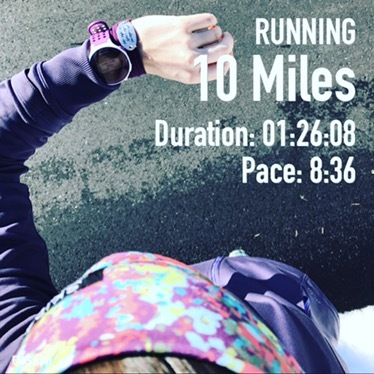 I had 10 miles scheduled, I could have jumped for joy seeing a training run for less than an hour and a half! When was the last time that happened? Probably 15 weeks ago ha! I rolled out of bed at 6:45, cranked up my Spotify and headed out the door. During that hour plus workout I thought a lot about next weekend and my past marathons. 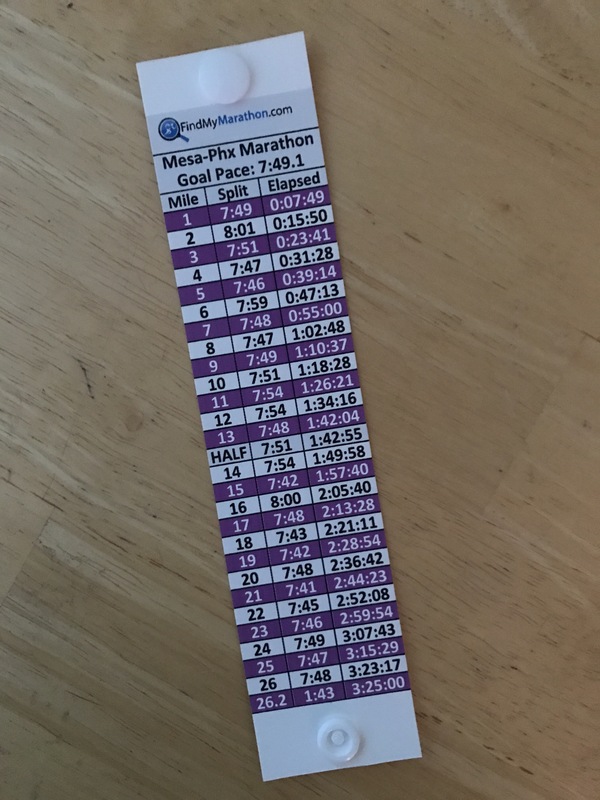 My first two marathons were a real mental struggle without a GPS watch, because every mile felt like it took years and I had no idea what pace I was running or what my projected finish was. 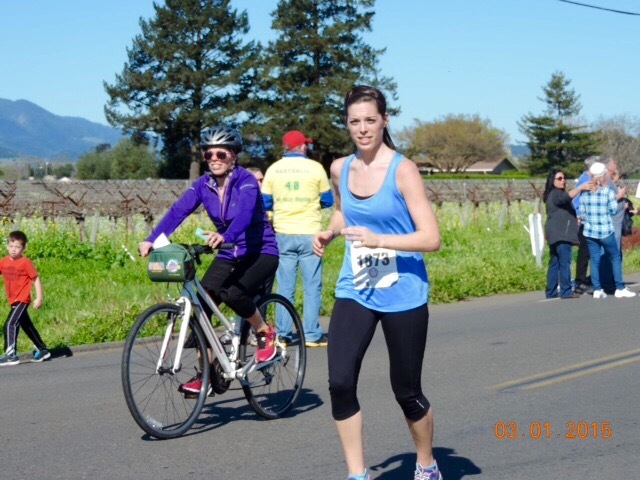 That perfectly explains the last time I raced Napa, aka my first marathon! I remember the weather was perfect, the morning was a it cold but once the sun was up it was 60-70 but not too hot. It was an early start of 7 am which I loved. It is also a small race of around 1,000 runners so you feel spoiled because the volunteers can pay attention to you! Anyway, I remember going out hard, too hard, making it to around 16 before I texted my mom saying I was dying. I remember her response because it truly helped me finish the race. She said, just relax and enjoy the scenery. She was right, this was my first marathon and a new place. I should at least be taking in my surroundings. I tried to focus on that instead and eventually when I made it to the last 5k, I found my family on bikes. My sister biked to the finish with me, while I complained that my legs were no longer there. She assured me they were. I crossed the line in 3:42 and was so happy. I did it, but most importantly I survived one of the hardest mental battles I have ever had. Break up the course and think of it by sections or by water stations. This one really helps me mentally. 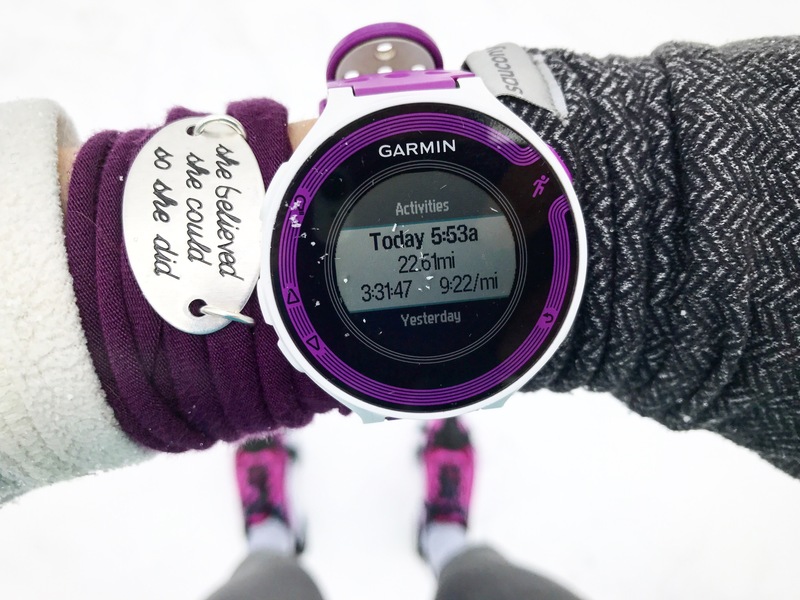 Sometimes thinking in terms of miles will overwhelm you. I mean when I am two miles in, telling myself I only have 24.2 miles to go DOES NOT HELP. Instead, know where the water and fuel stations are and think in terms of those. If there is an aid station at mile three, then two miles in you only have one more mile to go! Then once you are there you pick the next one and focus on that. Or do this in terms of surroundings, pick a building or in my case a winery in the distance, focus on getting there then pick the next destination. 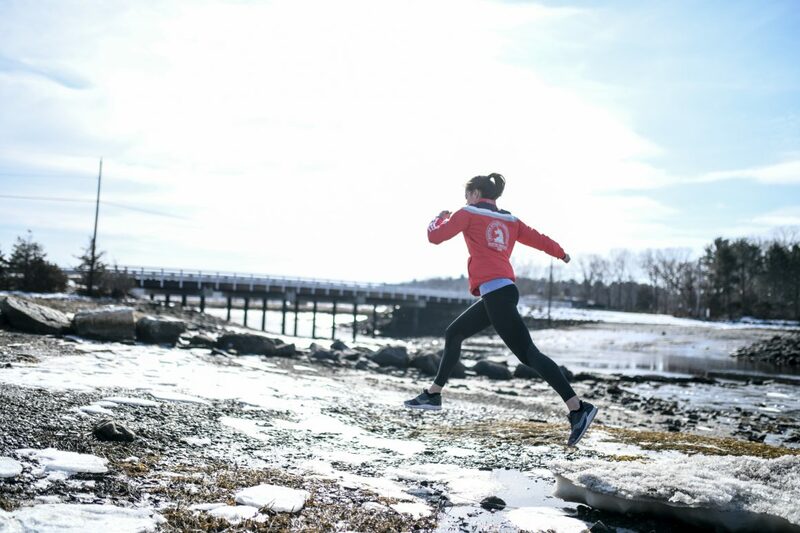 Mental tricks are key, because with a race as long as the marathon, your mental game can bring you down if you let it. So don’t let it! Music and pump up playlists. I don’t always listen to music but when I do its because I need a distraction. I need to just fall into the music and stop thinking and just go. For racing I usually don’t listen to music, I want to try but am afraid to break the barrier. Napa is a no headhones race, so this marathon won’t be the time, but potentially in the future! I would caution you to be wise in your music choices, some songs really pick me up and get me going, but others can really slow me down. 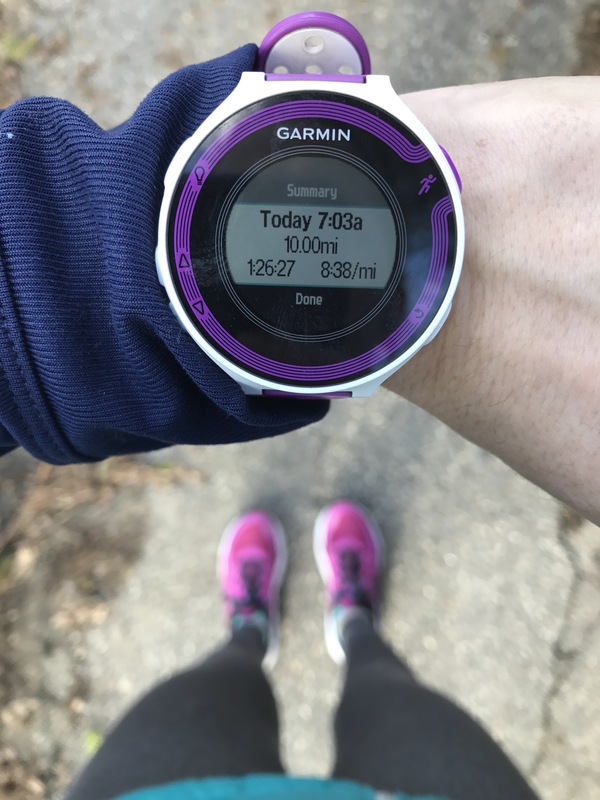 It’s all about the beat for me, If I were to race with music, I think I would focus on the first 16 miles without music, so that I don’t go out too fast and then I would plug in my music and get ready to power through the final 10 miles! Napa 2017… to be determined! Anyone else get into taper mode and find that your wallet takes a hit? I seriously can’t stop online shopping. When it’s two weeks out from a big race I don’t know why but I tell myself I deserve everything! I mean I do (kidding), but my bank account says otherwise. 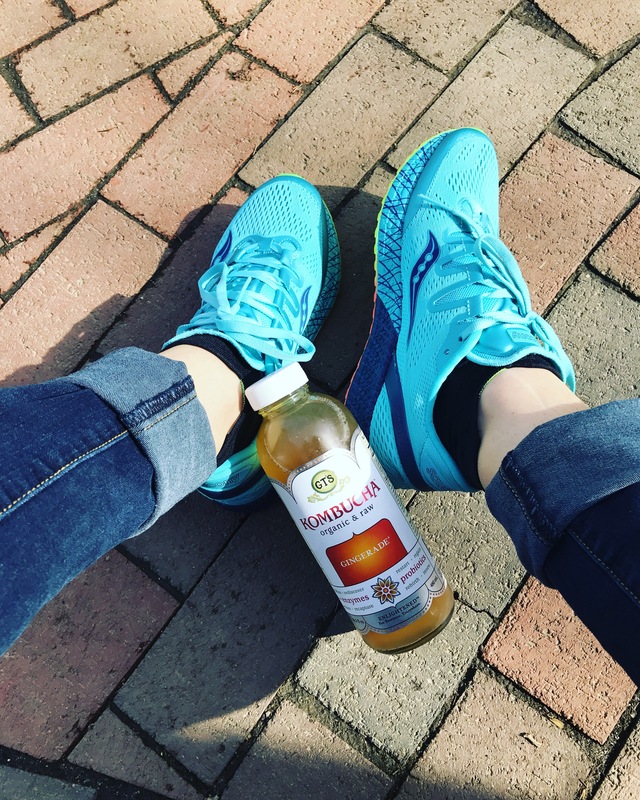 So I wanted share what’s currently in my shopping cart, also known as all my go to running necessities! 1. Compression socks. Let’s be honest I don’t know how I ever lived without these. 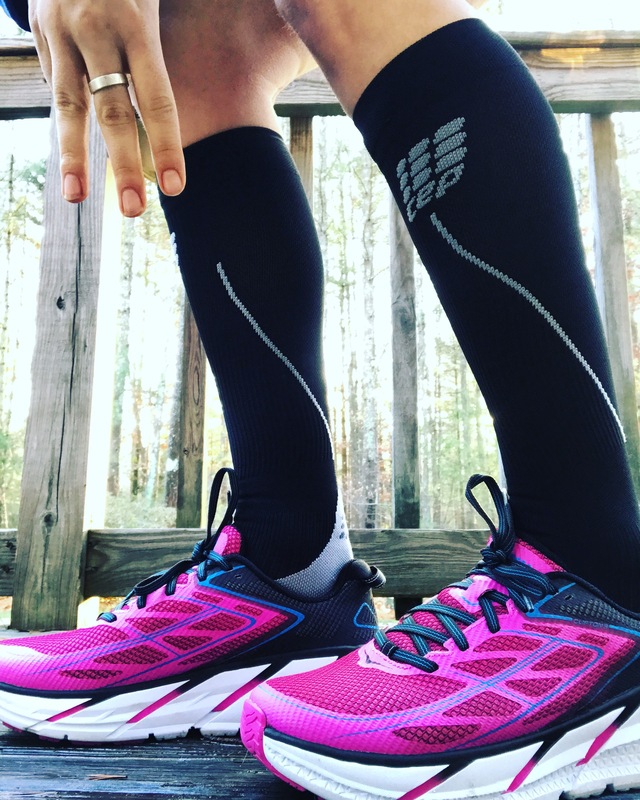 My favorite brands are CEP and Pro Compression, each for different reasons. CEP is the perfect amount of pressure, once you get them on. The only downside is the struggle to get them on my feet. Let alone once they are on my feet I still have to pull them up my calf. It basically almost always ends in me almost throwing a tantrum until miraculously I have a breakthrough. That being said, once they are on they are amazing. Pro Compression are much easier to get on, bonus there! 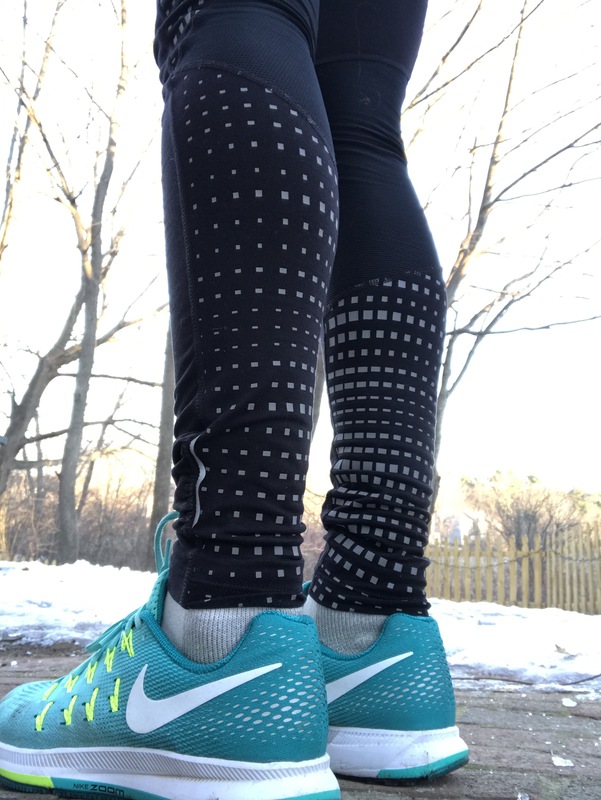 Also they come in so many fun colors and designs so they are great to brighten up a run. I am always excited to match my outfits or my socks with my shoes. I know, I am that person. They are decently tight and do provide relief in aiding in recovery, but not as tight as CEP. 2. 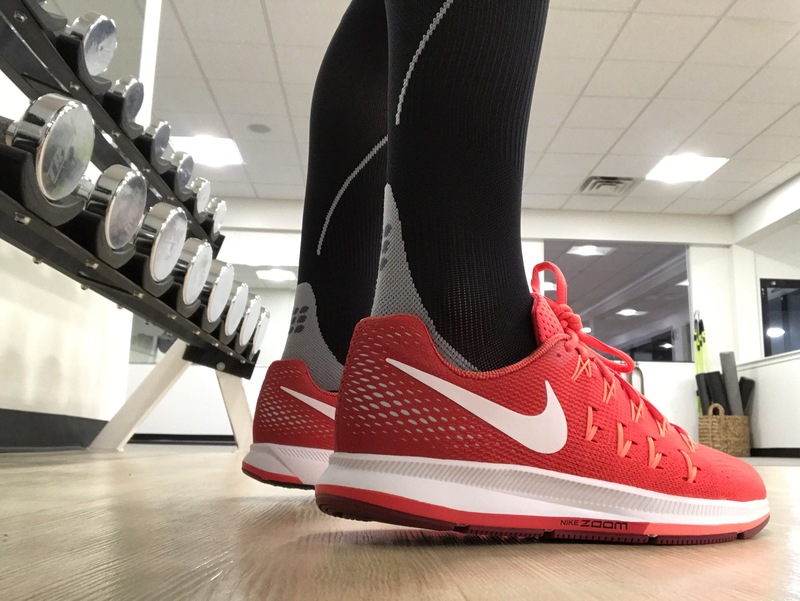 Nike Pegasus Shoes. I don’t even know where to start in discussing my love for these shoes. Before this year I was anti Nike, I couldn’t even tell you why! I don’t think I thought they had enough support… but this past fall that all changed. My friend got a pair and I instantly loved the style, so I bought a pair and then another, and now I have another waiting for me to click confirm purchase… These shoes I use for racing, tempos and speed, so in all honestly I need at least three pairs! Right? 3. Senita outfits. I only recently stumbled upon them and their clothes are so fun and affordable. I am always looking for patterns and ways to mix up my outfits. I purchased a pair of capris the other day and wish that I could wear them everyday. The outfit I currently have waiting for me to click complete is here and here. 4. Momentum Jewelry. I mean I should have all the inspirational quotes all up and down my wrists for this marathon, am I right or am I right? I don’t think any more explanation is needed, we all know the marathon struggles and the little things that surprisingly help you get to that finish line! 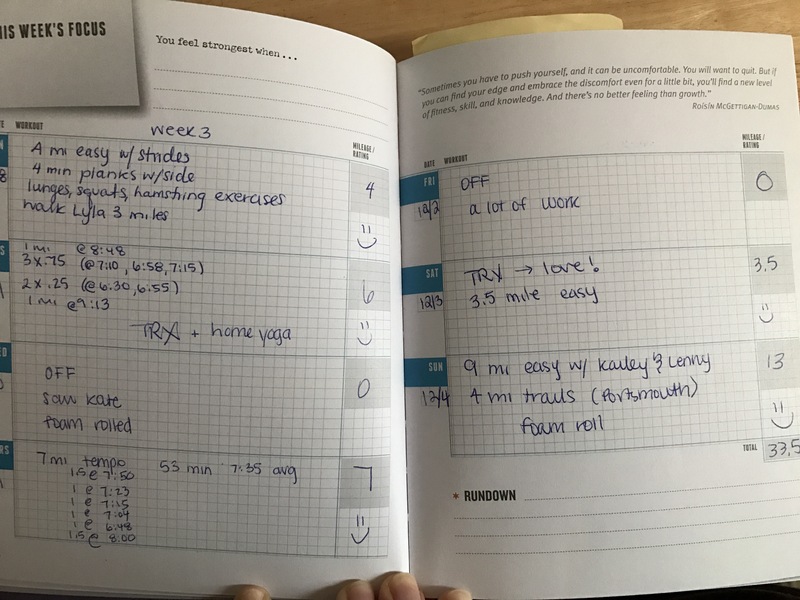 Recently I read the book Run Faster by Brad Hudson which talks about the importance of listening to your body and adjusting your training plan as you go. He stressed that a training plan is just that, a plan. It is also doesn’t know you and what is currently happening in your life. Does it know that you are overworked and struggling to get enough sleep let alone a run? No. Does it know that you are in bed with the flu? No. Does it know that you unexpectedly had to travel for work? No. Does it know that you just got a puppy that wakes you up three times a night? No. That was me last summer! With all these factors that the plan doesn’t see, why do we follow them so religiously? Maybe you all are better at this than me, in that case maybe I am talking to myself. However, I am a perfectionist, so when I get a plan that is designed around my race goal, I want to follow it to a T. I will do everything to hit every workout because in my mind that’s the only option. This may seem great at first, but it has been my downfall. It’s a strength and also my greatest weakness in regards to running. Not being able to adjust or adapt when necessary can cause you to overtrain or become injured, which is the last thing we want as runners! The past two training cycles this has happened to me. A lot of other factors played a part in my overtraining, but the one thing I definitely could have done a better job of was listening to myself. 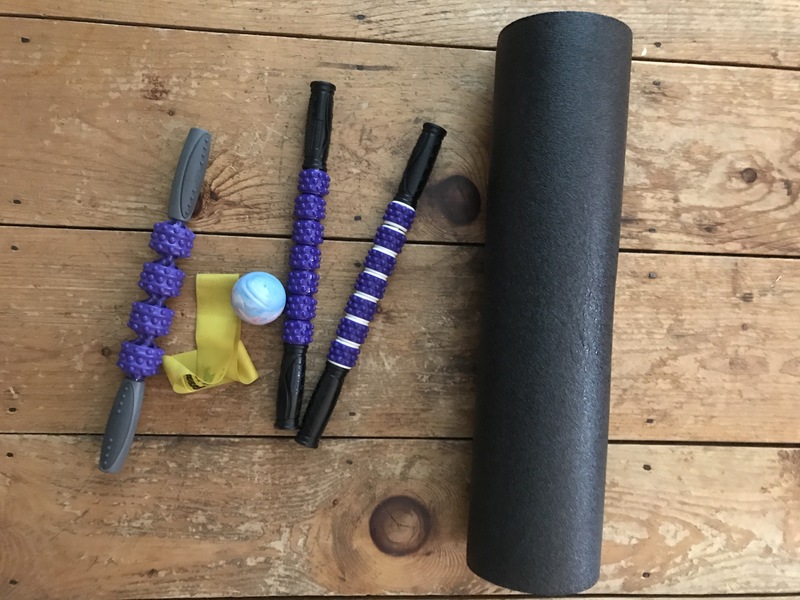 When you are sick or your IT band starts to hurt, what is the harm in easing back mileage or taking some extra rest days? After weeks of training what will one skipped workout do? Nothing. It won’t hurt, it will probably be beneficial in the long run, but it’s hard to look ahead and see the big picture. It’s hard to step back and lift up. When considering skipping or modifying a workout that’s when the irrational thoughts creep into my head. If I skip this workout I will never hit my goal, I am throwing all my work down the drain, I am not as strong as I thought. These are all thoughts that go through my head and they are all absolutely ridiculous! None of those are true, weeks of training and hitting my workouts proves that. One workout can’t undo everything, all the hard work. We have to remind ourselves of that. We have to be mentally strong and confident in the process and the training. Trust. This training cycle I have been working at listening to my body more. All I can say is it’s a work in progress. Luckily, I felt great all through my training cycle up until last week when I got a nasty cold. 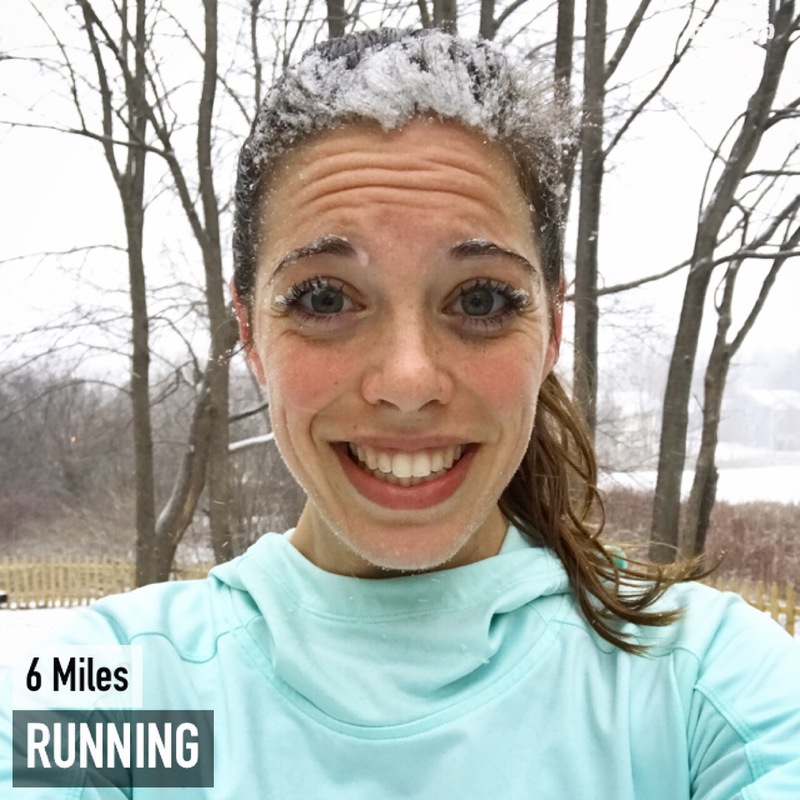 I could barely breathe through my nose and I still wanted to attempt my runs. 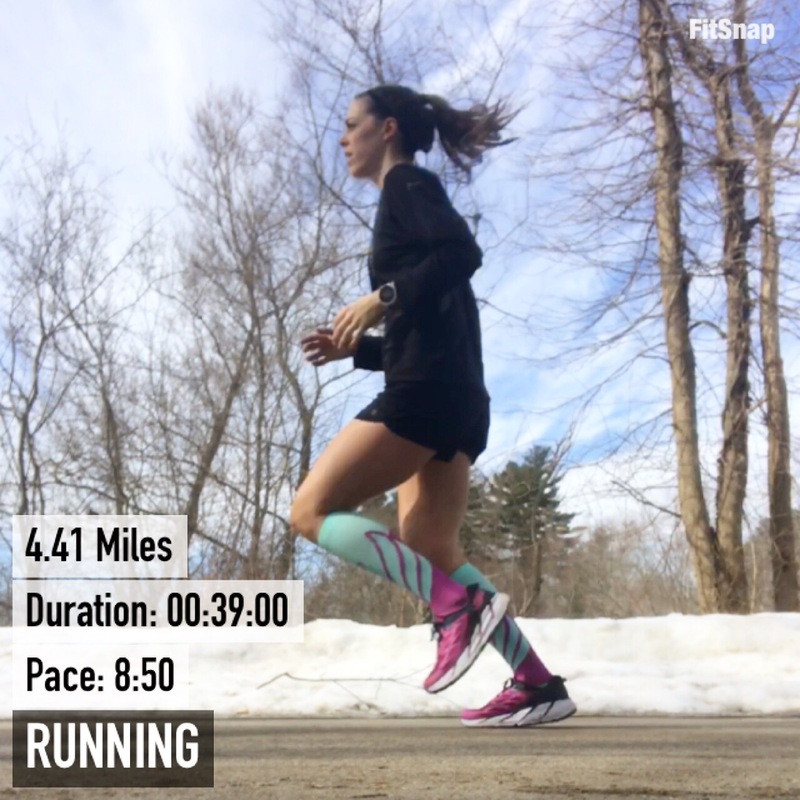 And I did do the easy runs, but I rearranged my schedule for the week because I knew the tempo was not possible. So at least I could recognize that, but going forward I hope that next time I can just rest. I can be confident enough and truly know that resting will benefit me the most. 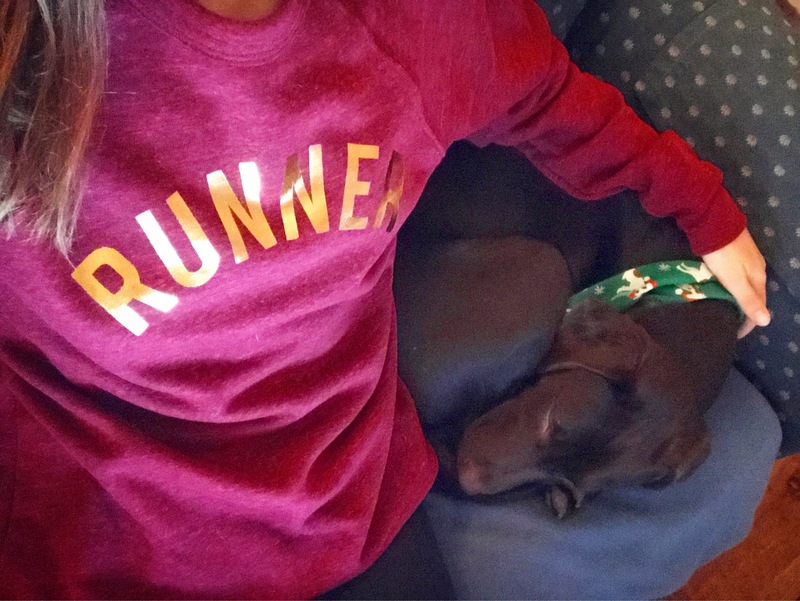 Life does get in the way of our running sometimes. How dare it, but it does. If it’s beyond your control, cut yourself some slack. 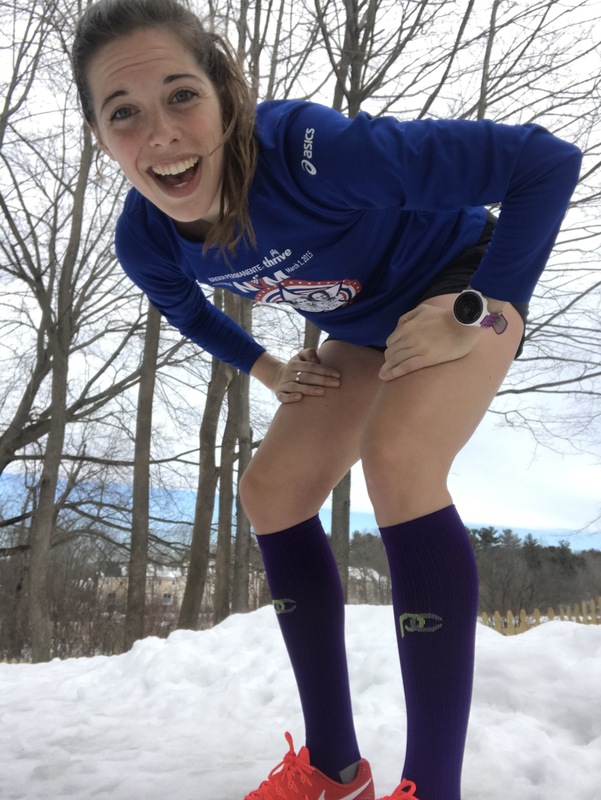 Be able to rearrange your runs, or modify a run- go out and attempt the first half of a tempo, or skip it all together if forcing it will do more harm than good. It’s okay. But even more than that, take note in how your body responds to your training and adjust as you go. It’s all a process and a journey, but in the end we will get there. 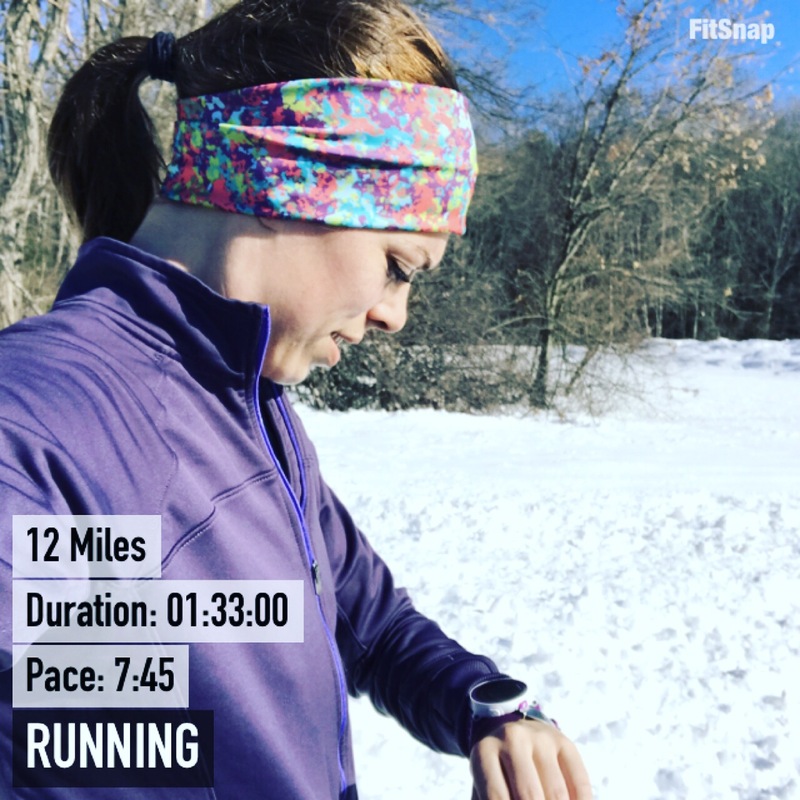 This week was probably my hardest week yet for running due to leftover snow from last weeks storms and a cold that took me down a few days. However, I made it and feel so much better today! Now I just have to avoid getting another cold for the next two weeks!! 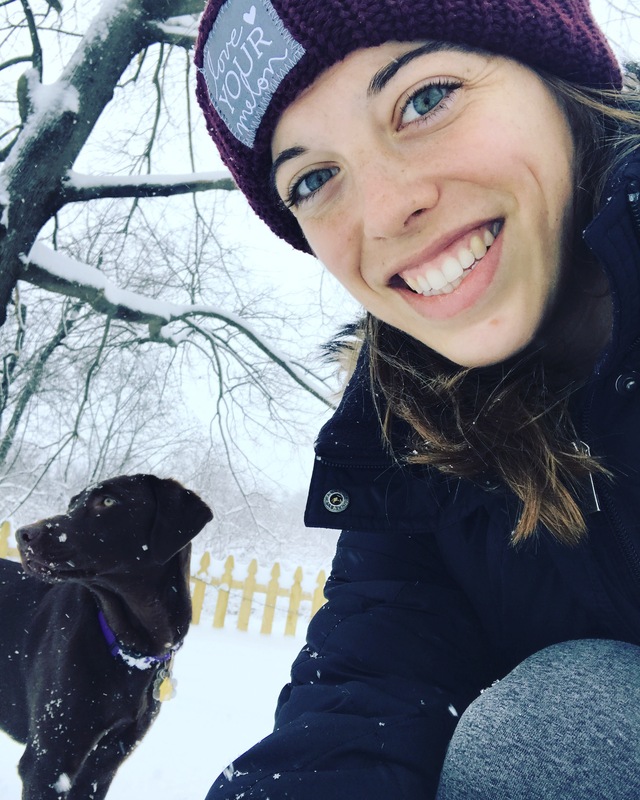 Monday: An early morning snowshoe with lyla, yoga and a 5min plank! 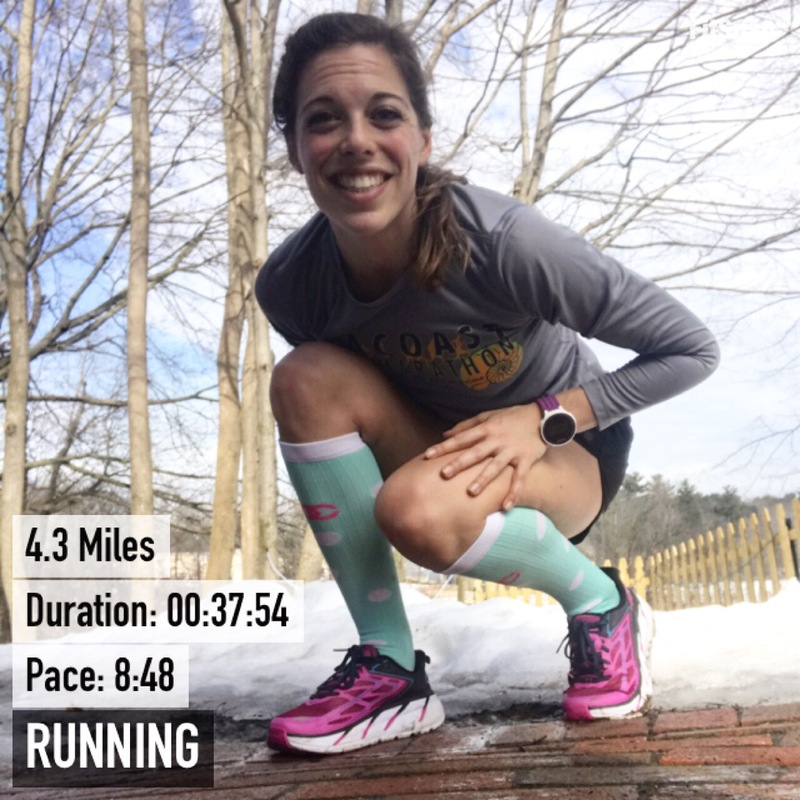 Friday: 12.1 tempo miles, 2 mile warm up, 2×1 mile (7:02, 6:46) with .25 recovery, 5 miles @7:30 (7:29, 7:15, 7:29, 7:12, 7:33), cool down to 12 total. This was a very difficult workout after being sick but I did it! 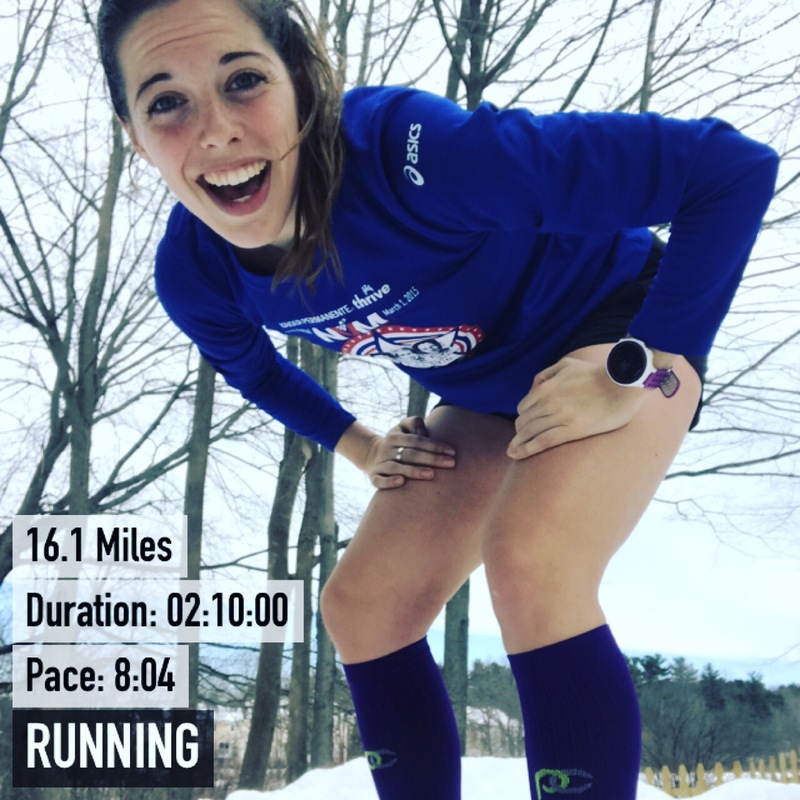 Sunday: 16.1 tempo miles, 4 mile warm up, 10 miles @7:35-7:50 pace (actual 7:53, 7:43, 7:28, 7:28, 7:42, 7:44, 7:48, 7:39, 7:41, 7:40), 2 mile cool down. 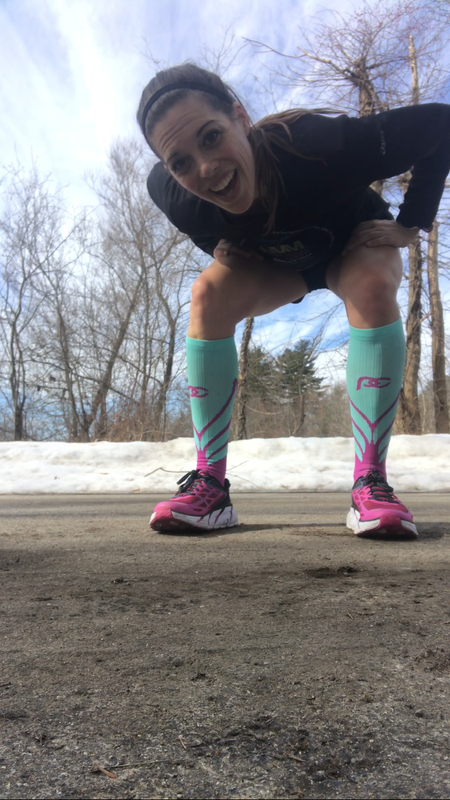 Hitting those paces felt impossible but the shorts weather carried me through and my new compression socks! I have ran three marathons so far and looking back on it now I didn’t train smart for any of them. Honestly I didn’t know what I was doing. To run a race you just go outside and run right? Yes, but if you want to run your best race probably not. I should have known this, I ran track in high school and was pretty good. I must have repressed the memories of my speed days on the track with 400’s and 800’s. Or maybe I figured those workouts wouldn’t benefit me for a half or full marathon. In high school I ran the mile, 2 mile and sometimes the 4×400 relay. 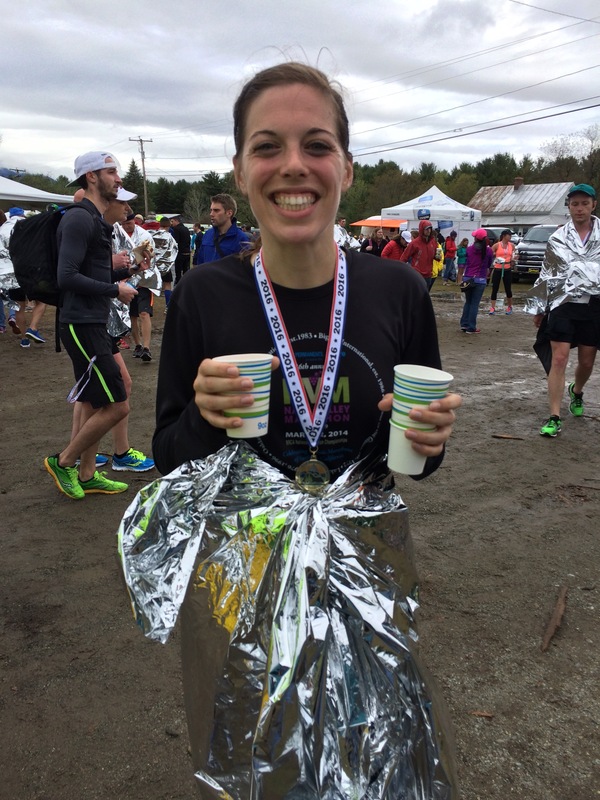 Those were so short compared to 13.1 miles or 26.2, right? Right in that they are short, but all training is best with variation speed, tempos, long runs, short runs, hill runs, etc. 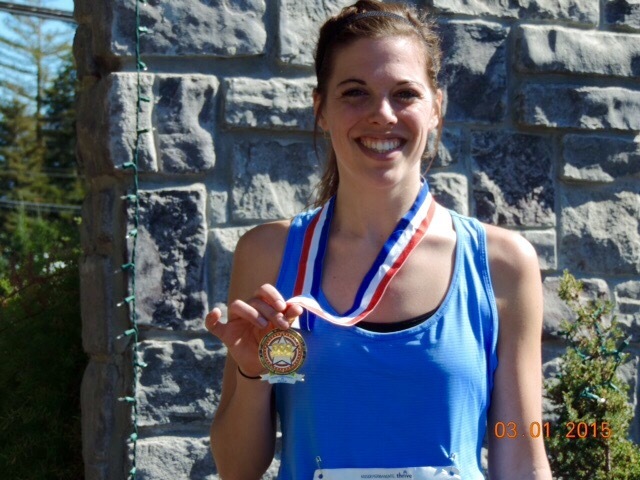 When I signed up for my first marathon I just wanted to finish the race. I had just gotten back into road racing and wanted to complete a new distance. I printed a plan online and just got to it. That’s where I went wrong. This plan was not geared to me. It didn’t know who I was or what my history of running is. It doesn’t know what’s going on in my life now. It knows nothing and can be a great base but I shouldn’t live and breathe this plan. I ended up running the same pace every run. On days I did run I felt I had to go at least five miles. I kept building miles and that was all. No variation, no cutback weeks. I cutback the length of my long run but not really my overall miles. As you can guess I got injured. I was able to run my race but near the end of my training I took a rest day after every run. My most recent marathon I got one step closer to training better. I incorporated a speed day. I trained with friends from work and we ran most our runs together it was great! 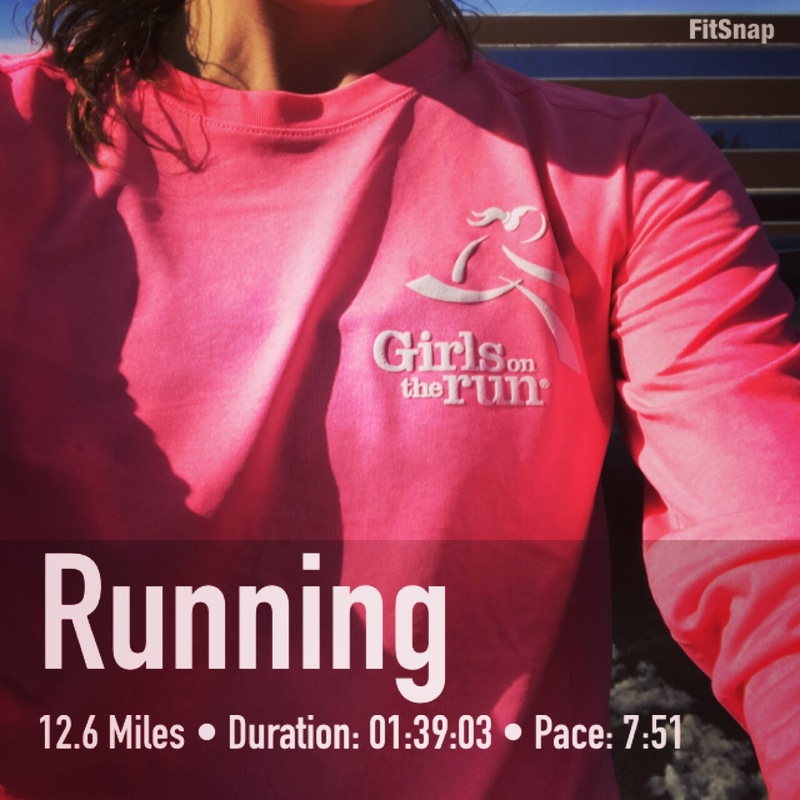 The mistake I made this time was running all my runs too quickly, a pace that my body hadn’t adapted to yet. I got to the race and I BQ’d but I overtrained. I felt sluggish going in and I took the whole summer off from any sort of formalized training and racing. 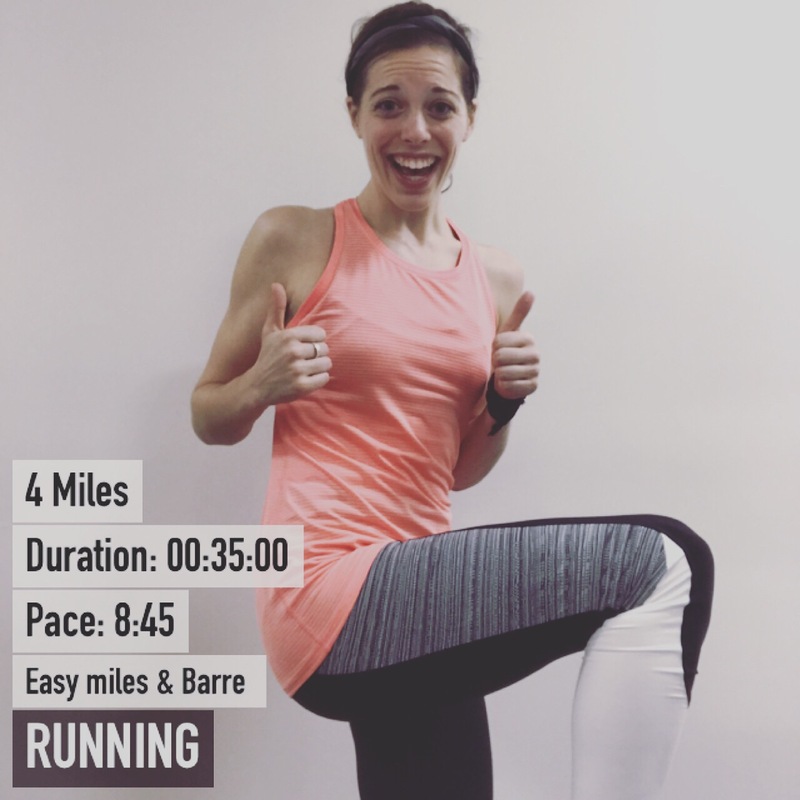 My marathon is now 2.5 weeks away and I am so confident in my current training cylce with Victoria from run4prs. I got a customized plan from her and it opened my eyes to everything I did wrong in the past. It also opened my eyes to my potential if I train right! I feel like I am in the best shape I have been in since high school! 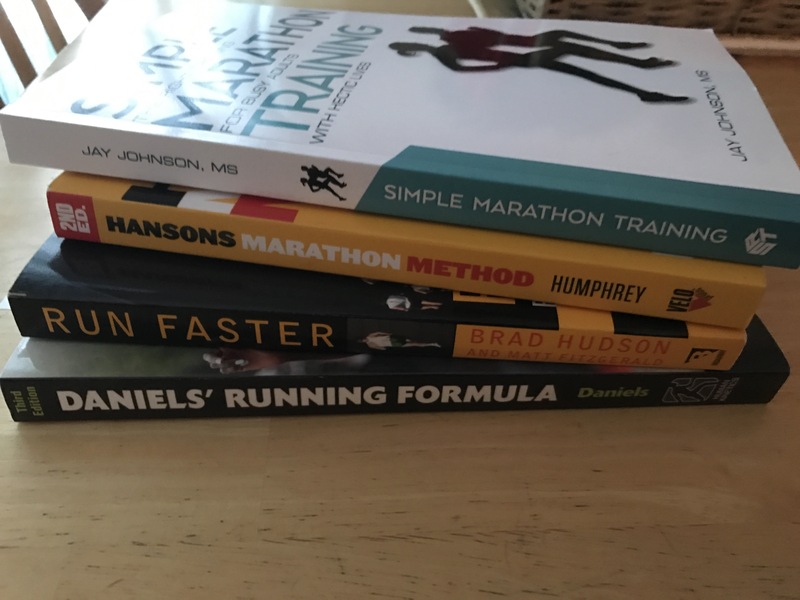 Knowledge- I read as many running books as I can to gain as many perspectives as possible. 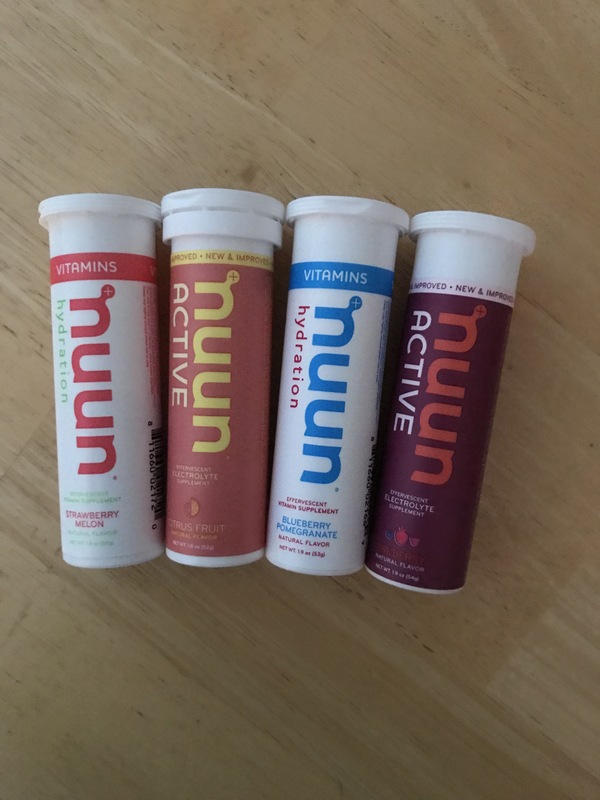 Hydration – I used to be so bad at hydrating now I love drinking nuun and also tea throughout the day! Almost there! Only three weeks away and this week the weather really tried to keep me inside but it didn’t. I am so glad I got out there and ended the week with 57.8 miles! 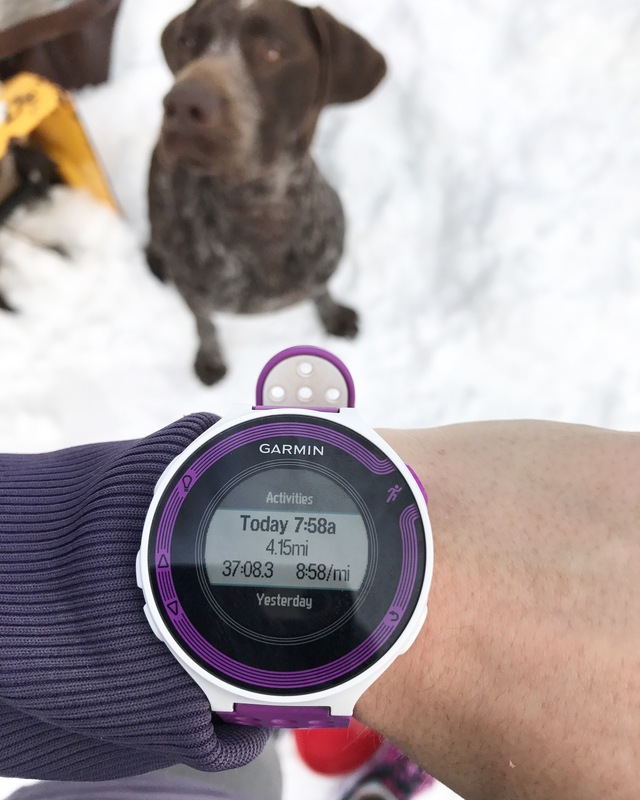 I managed 6 easy miles and also a 2 mile walk with my pup! Added 5 minutes of planks and 5 minutes of hamstring/glute work. I had to split this workout due to time constraints. I did 6 at lunch with a friend at (9:12, 9:07, 7:38, 8:33, 7:21, 7:32). Then I finished it up with 6 speedy miles after work at (7:40, 7:30, 7:31, 7:30, 7:35, 7:11). I was racing the sunset! Due to the snow storm Thursday night, I took this to the treadmill at 5 pm. The scheduled workout was 4 x 1 mile at 7-6:45 pace. 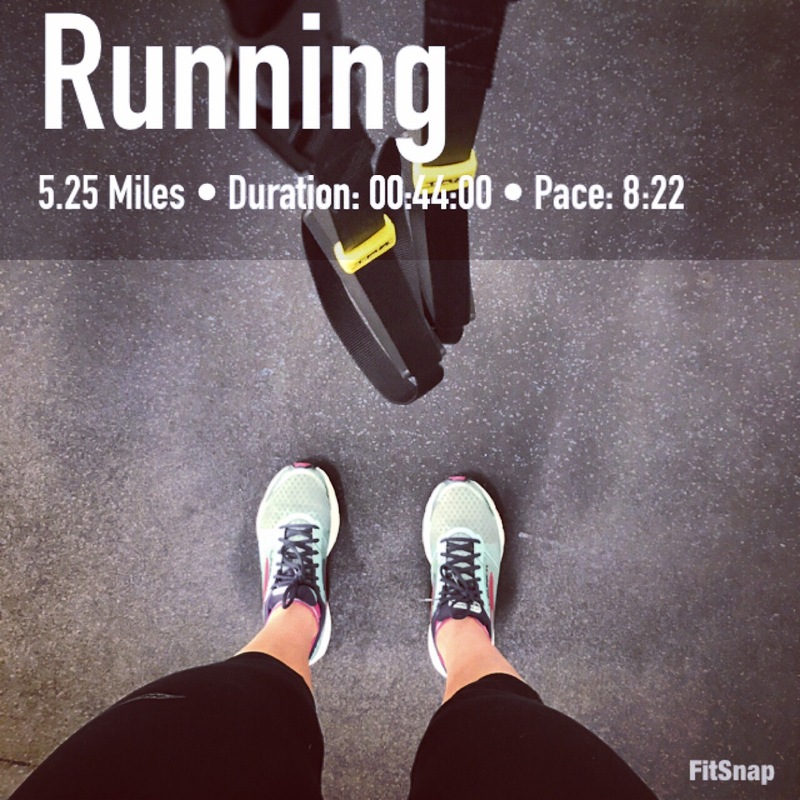 I decided to progressively get faster since I can set the pace on a treadmill (the positive). 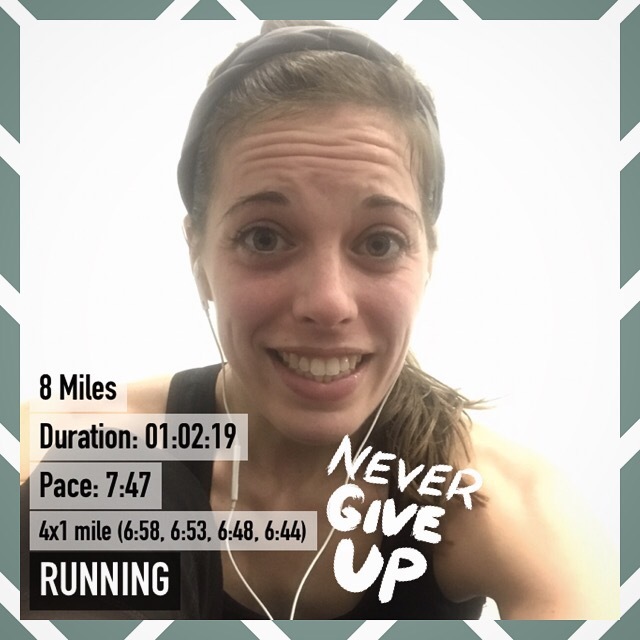 Managed 6:58, 6:53, 6:48, 6:44 as my miles! Overall finished just over an hour. Added some TRX abs to finish. 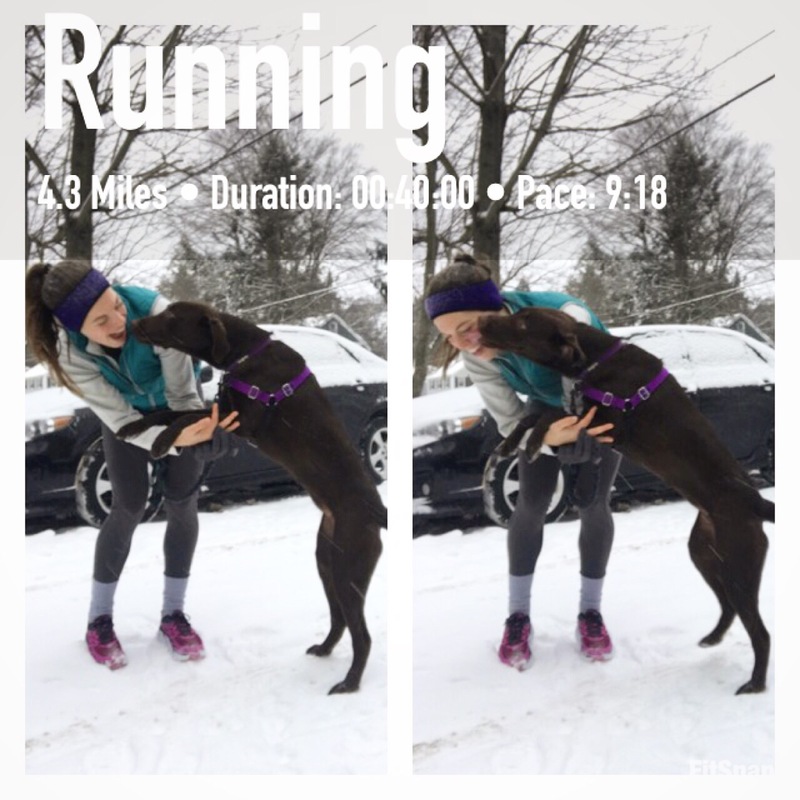 I ran the first 3 with Ruger and the last mile with Lyla, so the pups were happy. 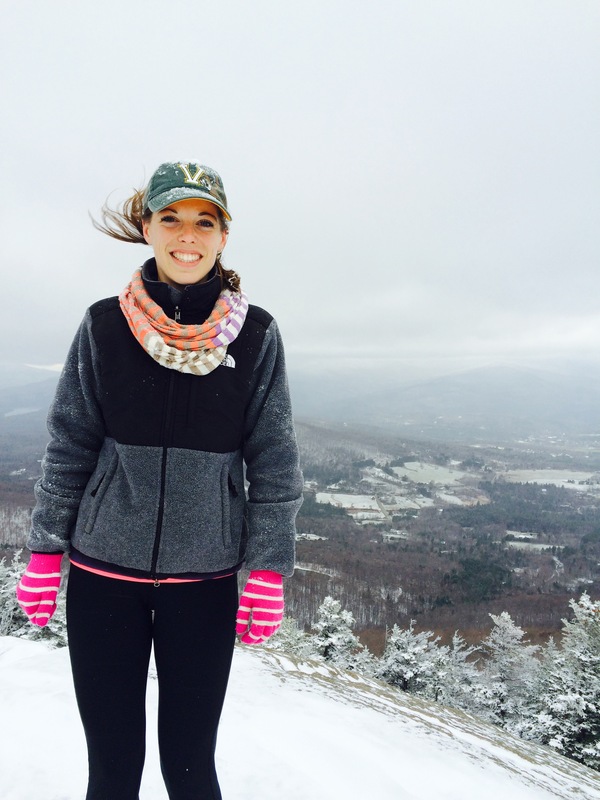 I then took Lyla snowshoeing for two miles, which was an adventure. Concluded with 25 minutes of strength for the day. Nothing was easy about this because the roads were awful from the snow on Saturday, but it’s done and in the books! Now for week 14! 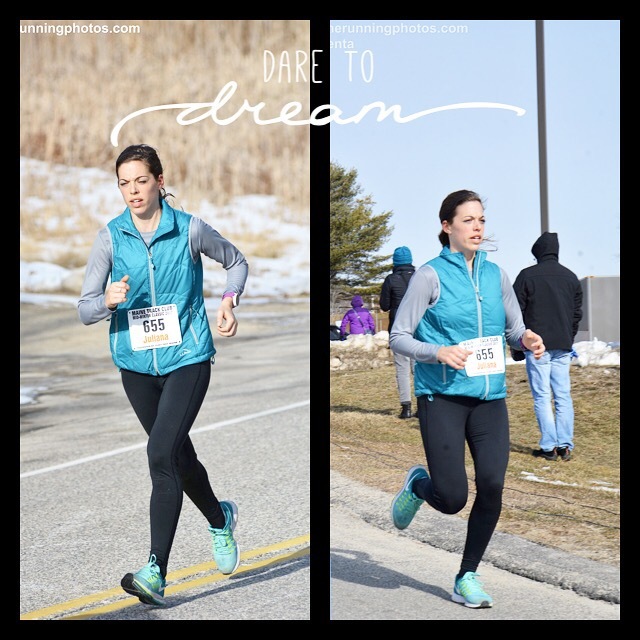 It calls for less total mileage but more race specific workouts, getting excited for March 5th!! 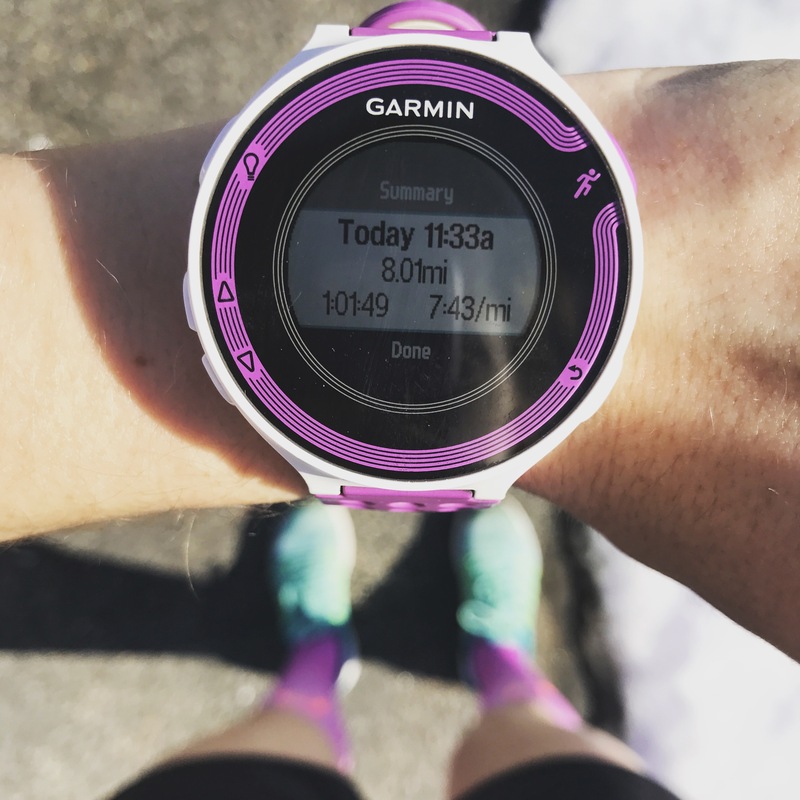 Anyone else already dreaming of their summer/fall races? Considering trying to get in to a few bucket list races like Mt Washington, Beach to Beacon and the Falmouth Road Race! What are your favorite races?